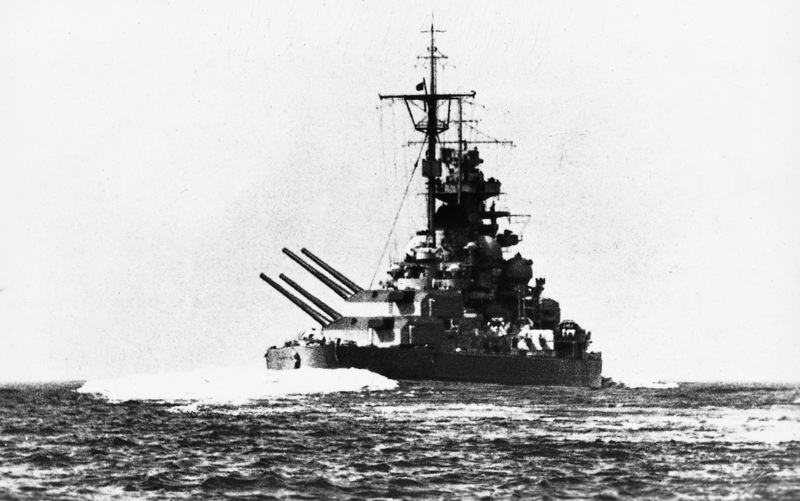 The mighty battleship Tirpitz was laid down in October 1936 and was originally known as Schlachtschiff G or Ersatz Schleswig-Holstein (Replacement Schleswig-Holstein). She was launched on 1 April 1939 and completed in February 1941. From early 1942 she was based at various locations in Norway, and on 8 September 1943 she sailed from Altenfjord to bombard shore installations on Spitzbergen – the only time she fired her guns in anger against a surface target. On 22 September she was damaged in an attack by British midget submarines, and on 3 April 1944 she was further damaged in an attack by carrier aircraft of the British Fleet Air Arm, sustaining 14 bomb hits and suffering 122 dead. She was subjected to further attacks by the Fleet Air Arm in August 1944, but sustained only minor bomb hits. On 15 September 1944, however, she was attacked by RAF Lancasters while at anchor in Tromsö and was damaged by one of the RAF’s new 5443kg (12,000lb) “Tallboy” deep penetration bombs. She was now no longer seaworthy, but on 12 November 1944 she was again attacked by Lancasters carrying ‘Tallboy” bombs and received two direct hits, capsizing with the loss of 902 officers and men. Her hulk was gradually cut up over the next 12 years.